THE LOOP — Mayor Rahm Emanuel's newly appointed interim top cop Eddie Johnson's fiancee is a Chicago Police lieutenant named in an investigation into alleged cheating on the department's lieutenant's exam, DNAinfo Chicago has learned. It's the same cheating probe that sources said helped derail Deputy Chief Eugene Williams' chances of being promoted to police superintendent. Now the allegations are part of a separate probe, this one by the city's Inspector General Joe Ferguson, sources said. Williams, one of the Chicago Police Board's three superintendent finalists passed over by Emanuel, was a "senior subject matter expert" who helped create the most recent lieutenant's exam. And he was the "final reviewer of potential exam content," according to the Police Department's Feb. 17 response to a Freedom of Information Act request obtained by DNAinfo Chicago. The probe into the alleged cheating began in November 2014, more than nine months before the written portion of the lieutenant's exam was administered, after a police Internal Affairs investigator filed a complaint based on a tip from an anonymous officer. Mark Konkol talks about the latest twist in the Top Cop job drama. That complaint questioned whether Williams shared "information that was privileged" about the exam to sergeants in a study group that met at police headquarters. The information would give the sergeants an unfair advantage on the test, according to a confidential police Internal Affairs report obtained by DNAinfo. The study group included Johnson's fiancee, Lt. Nakia Fenner, as well as Lt. Maryet Hall, who is married to former First Deputy Police Supt. Al Wysinger, who retired last year, and Internal Affairs Lt. Davina Ward, multiple sources told DNAinfo Chicago. The whistleblower claimed to have witnessed Williams hosting the exam study group — that included Fenner, Hall and Ward and at least three other unnamed African-American officers — at 6 p.m. Tuesdays in an executive conference room at police headquarters. "I work at HQ and have personally confirmed the existence of these weekly meetings. Come see for yourself," said the whistleblower's typewritten allegations included in the Internal Affairs report. “What information is he sharing with them that is not being made available to all sergeants regardless of race?" the whistleblower asked. 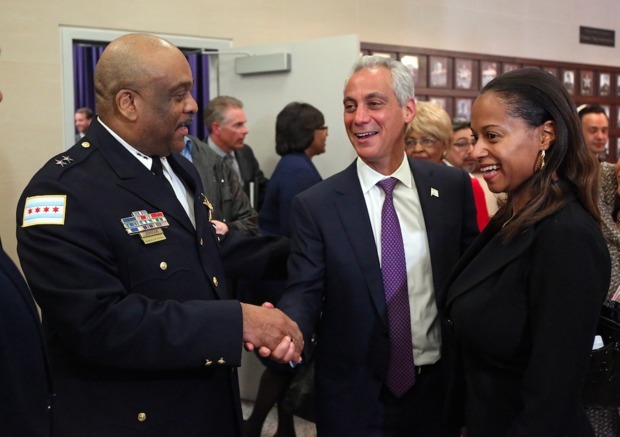 Fenner, who declined in an interview with DNAinfo Chicago to characterize her relationship with Johnson, was part of a small group of family members who celebrated Johnson's promotion to interim police superintendent at the news conference where Emanuel revealed him as his pick. On Monday, Johnson confirmed his engagement to Fenner. The interim police superintendent told DNAinfo Chicago that he was not aware of the ongoing probe into whether Williams used his knowledge of the test to give Fenner and others an unfair advantage on the promotion exam. Johnson said he had not been briefed about any investigation, telling a reporter, "I've never been informed of any formal investigation. You're telling me more than I knew." "Right now all I know is it to be rumor. I don't know if there is an actual official investigation. … Whether or not it's an actual subject of investigation I really can't tell you right now," Johnson said. The interim top cop said he had heard that allegations leveled against Williams and members of the study group came from an anonymous source. "I can tell you that Internal Affairs for CPD, we don't routinely handle anonymous complaints. I don't know how the [city] inspector general reacts or responds to that kind of thing," Johnson said. "So it's very difficult for me to respond." Williams did not return phone messages Monday evening seeking a response to the allegations. Johnson said he doubts that the allegations against Williams are true. "I didn't know that Eugene Williams had a study group," the interim superintendent said. "I don't think he did, to be honest." Johnson said he was aware that his fiancee belonged to multiple study groups, which he said is customary when people prepare for promotional exams. Fenner, however, told DNAinfo Chicago she "did not participate in any study groups." Fenner, a Deering District lieutenant, denied knowledge of any investigation into cheating allegations. "I haven't seen the complaint or been questioned by anybody," Fenner said. Indeed, there is no evidence that Internal Affairs conducted an investigation into the cheating allegations in the year and 4 months since the Internal Affairs complaint was filed. In February, a Police Department employee familiar with the allegations who was worried that Williams — a favorite of the City Council's Black Caucus who had the support of influential ministers — might become a finalist for the superintendent job sent a mass email to the entire Police Department. The email was sent Feb. 23 — six days before Williams was named a superintendent finalist. The email, according to the department employee, was to warn other officers the department's "Thin Blue Line" — the code of silence that protects officers who lie to cover for each other — had protected Williams and allowed "tainted" promotions. "The process is fixed," the employee wrote. The Police Department employee also contacted the city's Inspector General's Office, filed a formal complaint and has been interviewed three times by city investigators. The author of the email also provided the inspector general with the Freedom of Information Act request that confirmed Williams was integral in developing the lieutenant's exam and knew what would be on the test. "After months of pressing the police department for information on the subject, and being stonewalled at every turn I was forced to press the mayor's office for a final 'YES' or 'NO' on whether Gene [Williams] had access to the test," according to the email. The Freedom of Information Act response obtained by DNAinfo Chicago confirmed that Williams in his role as "senior subject matter expert was the final reviewer for the Chicago Police Department of potential exam content for the most recent sergeant and lieutenant promotional exams before they were administered." The Police Department employee said his mass email aimed to put his colleagues on notice. "I hope you all take this as a warning to all those taking future examinations that the process is fixed, and as evidence to all officers and sergeants receiving the tainted group of new 'lieutenants' to watch your back, and finally, to hopefully shame whoever the new superintendent is to revamping the entire promotional process to bring integrity to it," he wrote. Last week, Emanuel introduced Johnson as "the right man at the right time" to lead the Police Department through a very difficult time. In addition to skyrocketing shootings and murders, some very serious issues related to the code of silence within the Police Department will have to be tackled by Johnson. A U.S. Justice Department investigation of the department's policies and practices could make that work even more daunting. Upon his appointment as interim top cop, Johnson said his success leading the department will hinge on one word: "Trust." "I know that trust has been broken too often, not just in Chicago but across America, where abusive police practices have occurred," Johnson said. Chicago's new interim police boss told reporters that broken trust and "the few examples of excessive force" have overshadowed "incidents of courage and professionalism" and "undermine our department and our relationship with the community." "We have to own it, and we have to end it," Johnson said. "Let me say that again. We have to own it, and we have to end it." He thanked the man he replaced, interim Supt. John Escalante, and his command staff, which includes Williams, saying their "experience and support is critical as we move forward." Now the investigation into Williams' alleged involvement in a cheating scandal that ultimately led to Emanuel's appointment of Johnson, who did not apply for the job, raises questions about whether the deputy chief — and the new interim top cop's judgment — can be trusted. In an interview with DNAinfo at police headquarters on Monday, Johnson said, "I've staked my whole career on being honest, fair with people, and integrity means a lot to me." "When investigations occur, whoever is involved in that investigation, they deserve due process," Johnson said. "Let's let the investigation play out." Johnson said in the interview he won't tolerate "intentional misconduct" by anyone in his department. “One of the byproducts of that is one bad cop makes it difficult for all the good cops on this job. One bad act will paint us all in that broad brush. Misconduct just simply can’t be tolerated," he said. “We are only as strong as the trust that the community believes in us. If they believe in us, they will partner with us and help to reduce some of this crime. The accountability issue has to be there." If the lieutenant exam cheating allegations are proven true, Johnson could be in a tough position that could require him to punish his future wife as well as some of his closest allies in the department and fellow board members of the Chicago metropolitan chapter of the National Organization of Black Law Enforcement — NOBLE for short. Williams is the organization's chapter president, and Johnson serves as its parliamentarian. Ward is the recording secretary on the group's board, according to a source within the department. All of the sergeants in the study group named by the whistleblower were promoted based on their test scores. On Monday, Johnson promised that if the Police Department's Internal Affairs investigation, initiated one year and four months ago, or the more recent city's inspector general's probe, concludes with findings of wrongdoing he would "deal with it accordingly." "Look, one thing that I have prided myself in over the years is not being a hypocrite. … If something comes back negative, and it needs to be handled then I will handle it," Johnson said. Johnson's personal connection to a subject of the cheating allegations also casts a shadow on Emanuel's decision to circumvent the Police Board selection process and install Johnson, whom the mayor publicly has said he has great confidence in as the department works to reduce violent crime and boost morale among the rank and file. Emanuel spokeswoman Kelley Quinn said in a statement: "There are unsubstantiated questions that have been raised and those questions are being looked into, as they should be." Quinn added that the Emanuel administration "has been aware of the unsubstantiated questions raised about the lieutenants' exam for weeks." "Interim Supt. Johnson made it clear from his first day that building trust is his top priority, and he already said he will take action should any wrongdoing be found," she said.